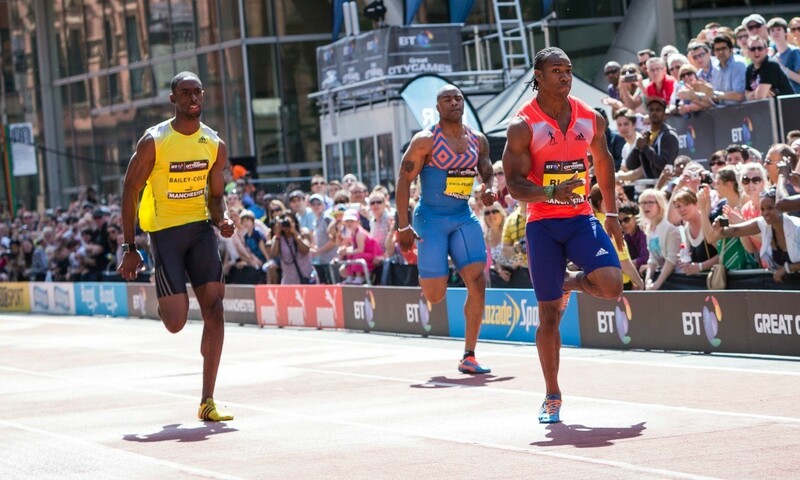 He came to Manchester with Usain Bolt’s 150m world mark in his sights and although he was some way off Bolt’s best Yohan Blake still dominated the final event of the BT Great CityGames on Saturday. Racing in Britain for the first time since he formed part of Jamaica’s gold medal-winning 4x100m relay team at the London 2012 Olympics, the 2011 world 100m champion clocked 14.71 to finish some way off his compatriot’s 14.35 recorded at the same event in 2009. But it was more than enough to see him victorious ahead of fellow Jamaican Kemar Bailey-Cole with 15.00 as he continues on the comeback trail from a hamstring injury that kept him out of the IAAF World Championships last summer. Chris Brown, who formed part of the Bahamas gold medal-winning 4x400m team in London, was third with 15.10 as Britain’s Mark Lewis-Francis ran 15.22 for fourth. Conditions were glorious in the city and so were the performances of a number of British athletes at the unique street event which, as well as the IAAF-certified pop up track on Deansgate, features an athletics arena in Albert Square in the city centre. Meghan Beesley left fans wondering what she might be capable of this summer as the 400m hurdler stormed the 200m hurdles on the straight track, attacking from the start and judging her pace perfectly to clock an impressive 25.05. A world best, her mark betters the 25.74 run by fellow Brit Perri Shakes-Drayton at this event last year and was 0.79 quicker than any of her rivals could manage. World 4x400m relay medallist Eilidh Child clocked 25.84 for the runner-up spot as their fellow 400m hurdlers European silver medallist Denisa Rosalova of the Czech Republic and world silver medallist Dalilah Muhammad of the US ran 25.86 and 25.90 respectively. Having last competed in February, such a strong season opener should provide a welcome boost for the 2011 European under-23 bronze medallist who clocked her 400m hurdles PB of 54.97 at the semi-finals of last year’s world championships is Moscow. If the 200m hurdles were an Olympic event it would surely also be the specialism of Andy Turner and he proved why with 22.58 in his second race of the day to beat Olympic 400m hurdles champion Felix Sanchez with 22.62. Earlier on and Lawrence Clarke had won a battle with Turner in the 110m hurdles, the Olympic fourth-placer clocking a season’s best of 13.51 following an injury-plagued 2013. Also on the comeback trail from injury, Turner clocked 13.55 to finish ahead of BUCS runner up David King, who ran a big PB with 13.85, having finished behind Clarke in Bedford earlier this month. There was a strong run and a clear win for Tiffany Porter in the women’s 100m hurdles. With 12.65 she clocked a CityGames record, beating the likes of Olympic bronze medallist Kellie Wells of the US and Britain’s Serita Solomon as 2008 Olympic champion Dawn Harper-Nelson took a tumble. Competing in the UK for the first time since his British record of 8.51m in Chula Vista last month, Greg Rutherford went head-to-head with Chris Tomlinson, who has questioned the validity of the Olympic long jump champion’s mark in California. With 8.02m in the final round, Rutherford was victorious, also beating the likes of Panama’s 2008 Olympic champion Irving Saladino who was runner up with 7.93. Tomlinson was third with 7.77m. The majority of attention was focussed on world indoor 60m champion Richard Kilty in the 100m as he looked to build on his season opener of 10.12 over the distance, having run 6.49 for that world gold in Poland. But it wasn’t to be, the ‘Teesside Tornado’ clocking a windy 10.19 to finish third behind Femi Ogunode, who claimed world indoor bronze behind Kilty in Sopot, with 10.10 and European junior 100m champion Chijindu Ujah, who clocked 10.14 for a big PB but with a +2.9 m/s wind reading. Shana Cox was among the 400m specialists stepping down to the 200m in Manchester and her windy 23.28 was more than enough to see her ahead of Stacey-Ann Smith with 23.85 and world 400m champion Christine Ohuruogu who ran 24.06 in her first competition since the world indoor championships relay in March. Earlier on in the programme and double world and Paralympic sprint champion Marlou van Rhijn won the T44 100m in 13.40 ahead of Britons Laura Sugar with 14.04 and Sophie Kamlish with 14.31, while Paul Peterson of the US won the men’s event with a windy 11.47. Germany’s Felix Streng came through to win the T44 200m in 22.40 ahead of 200m world champion Jarryd Wallace. Nikoleta Kiriakopoulou suffered a nasty injury in the first event of the day, the women’s pole vault. Having cleared 4.40m, which was enough for victory on countback ahead of Germany’s Kristina Gadschiew, the Greek 2012 European bronze medallist damaged her hand and wrist after her pole snapped and she was taken to hospital for treatment. Welsh vaulter Sally Peake finished third with 4.25m having competed on training poles, her competition luggage failing to arrive with her on her return to the UK, while fellow Brit Katie Byres was fourth with 4.10m.